Since getting our pup Kemper we have been trying to keep things pretty low key at home with him. For example, I’m more focused on the half dozen times we take him out at night instead of making a complicated dinner. But I don’t want that to mean that we are not eating good food. 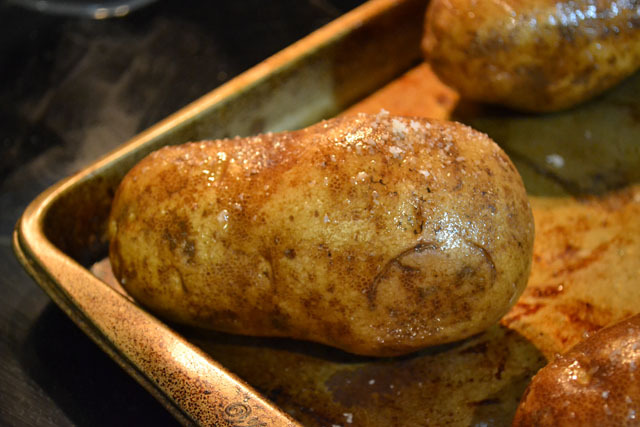 Which is exactly why we have been turning to making baked potatoes quite often to serve for or with dinner. I really love baked potatoes. Even when we go to Wendy’s- spicy chicken sandwich thankyouverymuch- I typically pick a baked potato over fries. They are great as a side or as a base to fun toppings. I personally love to pile on chili on them in the winter. Maybe add some cheesy broccoli with some hot sauce. Oh thinking about all these options are making me hungry! 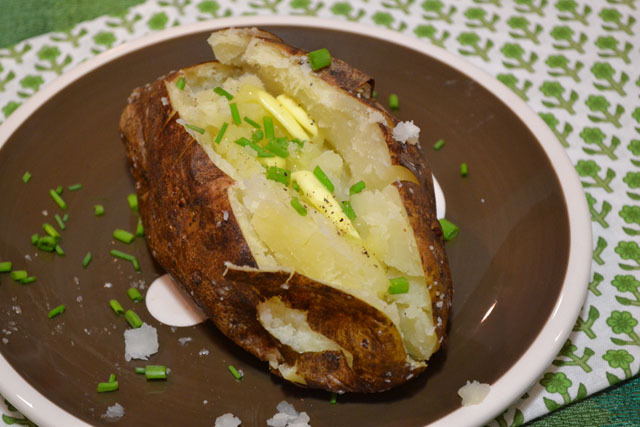 I hate to admit that when we are rushed that I’ll make a baked potato in the microwave but they are just not the same. The texture is different as well as you can’t get that great crispy skin. 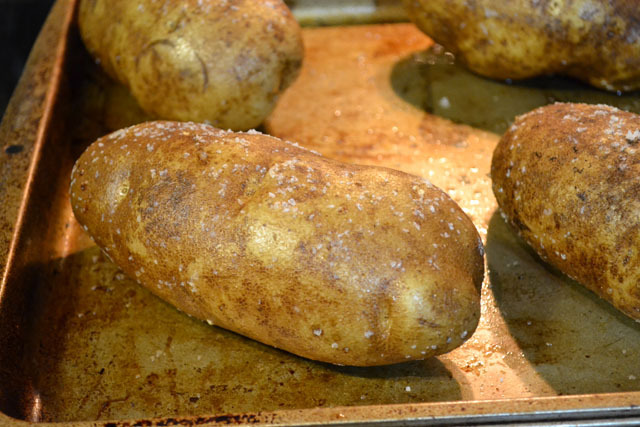 So just plan in advance and pop these in the oven and you’ll have a fantastic baked potato to enjoy in about an hour. Toppings are really endless but if you decide to keep it simple with some butter I insist you use a really good quality butter like Kerrygold because that is really going to make it just so wonderful. Wash the potatoes thoroughly. 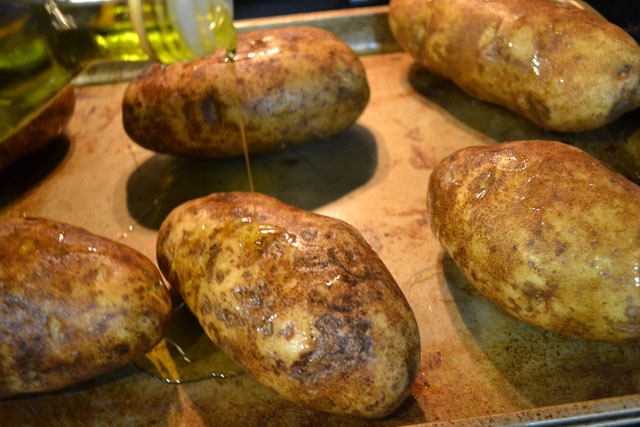 Pierce the potatoes all over with a fork, then rub the potatoes with olive oil and sprinkle with salt on all surfaces. 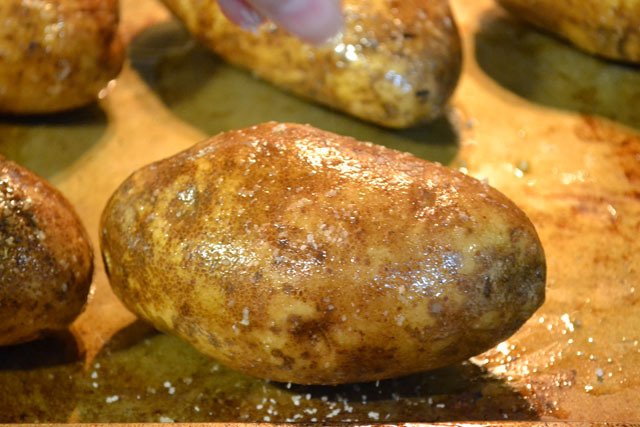 Bake the potatoes on a baking sheet for 50-65 minutes or until the potatoes are tender and you can easily slide a knife into the center. Remove from the oven and cool for 5-10 minutes. 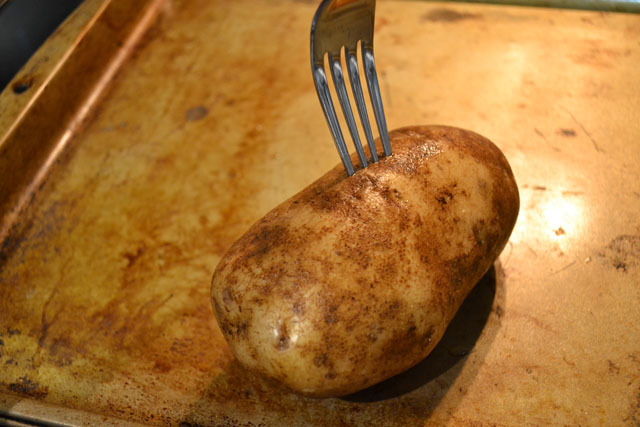 Slice the potatoes down the middle, then carefully pinch the ends with your fingers to fluff the potato. Serve with butter, chives, and pepper. Makes me hungry just thinking about one. Still no pictures but I can envision the potato in my mind. Yum! 🙁 I think it might be a block at work. I talked to dad and he can see them.